... nestled in the historic coastal hills west of Temecula. 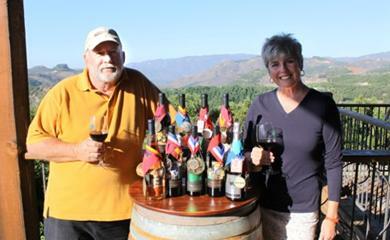 Surrounded by Avocado and Citrus groves, Manzanita covered hillsides, and sprawling horse farms, the vineyards sit high upon a hill with dramatic views of the De Luz Valley. The cool evenings and morning fog, coupled with sunny warm days, create a perfect grape growing balance of daytime growth and nighttime rest. Visiting the vineyards is like a visit to Northern Italy, complete with vistas of rolling hills, mist rolling in from the coast and vivid blue skies. This is the ideal environment for the production of 'old world' style wines, hand crafted to be food friendly while retaining the fruit expression. 2 for 1 TASTING COUPON 4U! Check out our Award Winning Wines!